Autoplate performs plate expansion calculations for both developable and non-developable surfaces. Help System - A comprehensive context-sensitive help system provides the user with valuable information on all features. Autoplate helps in the layout and forming of the shell plating. It is built around a proprietary, fast expansion algorithm. Autoplate works directly on hull designs created in Autoship. A typical project file (a .PR3) consisting of surfaces, polyobjects, curves and groups is created in Autoship and then read into Autoplate for plate creation and processing. Plates are created by defining boundaries, which are simply a combination of curves and surface/polyobject edges. Additional curves can be created in Autoplate as required. As a security feature, Autoplate saves its information to its own file and does not change the .PR3, so the Autoship project is safe from inadvertent alterations. Autoplate has many features and abilities similar to Autoship - the most noticeable are the interface, basic operation and many of the tools. This translates to less time to learn the programs and thus more productivity. Autoplate aids the design process by providing accurate visual information about the plate. The program presents metrical information, including colored renderings of Gaussian and mean curvature, scaled maximum deviation from the mean plate plane, backsets, twist and minimum radii of curvature. After expansion, further information on maximum strain value is available to help decide whether the plate has too much curvature and should be split. Plates are assigned to classes arranged in hierarchies. 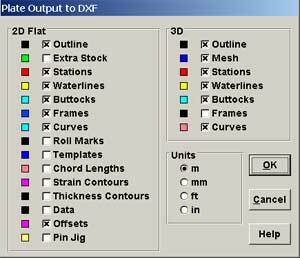 Each class has a stock (material, thickness and maximum dimensions) whose parameters may be edited in the 'class editor'. Autoplate offers several expansion options including shrink only, stretch only, constant perimeter and minimum strain. Additionally, strain may be isotropic or directional. The plate edge margin is user-definable. Plates may be expanded individually or in groups. 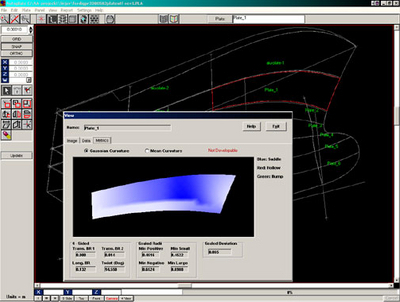 outline with or without margin stock, interior curve, contours (sections, waterlines and buttocks) and frame locations, roll marks, template shapes and locations, strain and thickness maps, pin jig setting and fabrication metrics. Panels of multiple plates have separate pin jig output. Hardware required: For optimum performance we recommend a fast Pentium with 132MB of RAM, 30MB free disk space, 8MB graphics card with OpenGL acceleration and a 1024x768 or better monitor.